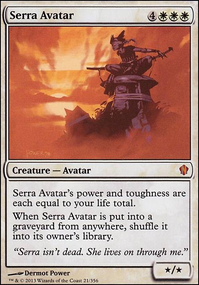 Degaine: I definitely want 4x Exclude , I've just been worried about not having enough two-mana interaction. Would you recommend removing Prohibit to fill out the playset or taking out some removal spells? I've been testing Think Twice over the past few days actually, and I'm definitely liking it more than AK. I wanted to test it for longer before making any changes, but I'm definitely loving it so far. You're right, the category should be "Deck Filtering." I fixed it. This deck is split two ways that don't really compliment each other. You have the value-oriented Blue-Green goodstuff, a great place for Tishana, and also have some merfolk tribal cards tossed in, despite only having 20 merfolk, you have 15 cards that want you to have merfolk. 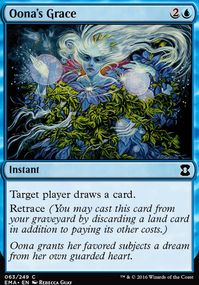 I'd suggest switching your commander for Kumena, Tyrant of Orazca and add more merfolk instead of the equipment and non-merfolk creatures, and drop the +1/+1 counter theme with cards like Bioshift, or move into the Blue-Green Value list, drop the merfolk tribal, and all of the less-than-great merfolk, and run more mana dorks like Llanowar Elves, Fyndhorn Elves, Birds of Paradise, Arbor Elf, Boreal Druid, Elvish Mystic, etc. to quickly cast Tishana and refill your hand. 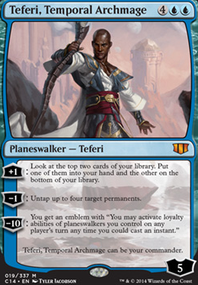 You could also just go +1/+1 counters, but that doesn't synergize heavily with your list, considering only two cards of your even can have +1/+1 counters, your commander and Prime Speaker Zegana. 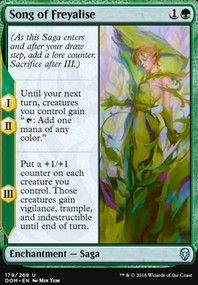 For more countermagic, Arcane Denial is really good, as is Swan Song, more removal would be like Beast Within, Song of the Dryads, and Imprisoned in the Moon the last two of which can turn off commanders, because you are just enchanting them, but they aren't leaving anywhere. They also lose all other types and abilities as they turn into lands, so they are effectively useless. First Opt could be cut for Preordain as it's just better all around. Dismiss, Exclude, Essence Scatter, Faerie Trickery, Logic Knot, and Spell Crumple these counterspells are just not very powerful and seeing as you have so many in your deck cutting six would barely hurt your ability to counter masses of spells. Dragonlord's Prerogative could go as its ability is a bit underwhelming. Nagging Thoughts and Capsize are also possible cuts. I really wonder how is this deck supposed to be competitive, as it just seems like a random bunch of cards thrown together. 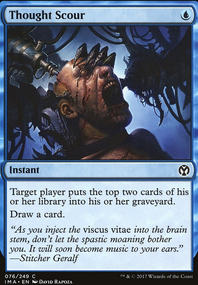 As a mono blue player myself (haven't updated my deck in a while here to be honest) I cannot keep myself from recommending some cheap draw like Brainstorm, Ponder, Preordain,Opt, Serum Visions, Gitaxian Probe. Some really good and cheap counterspells are Remand, Memory Lapse, Sage's Dousing (as your commander is a Wizard), Mana Leak, Force Spike, Exclude, Dismiss; just to name a few. 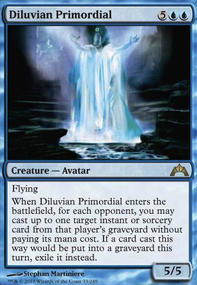 Solemn Simulacrum is a bomb in every Commander deck, and Frost Titan is a great finisher. I would cut Walking Ballista. I could probably write more bit this is what i could come up with right now. Hope to be helpful! Chiberia: I took Delver of Secrets Flip out in an eary build because I was still tweaking the creatures/spells ratio, and you're right, it definitely needs to be re-added. As for Unwind, if I had any Negates, I would replace them in a heartbeat. I don't want to replace Exclude because I'd like to keep all the good/relevant spells against creature-heavy decks be mainboard. I would love to add some Unwinds to the sideboard, I'm just not sure what to take out to make room.